House, Main Stream Hip-Hop, Top40, Mash-Ups. Thursday - Saturday: 10:00 p.m. to 4 a.m. Lounge is open nightly. Upscale & trendy (men are recommended to wear collared shirts). TAO may not be the newest property on the Vegas Strip, but its popularity more than trumps its age. 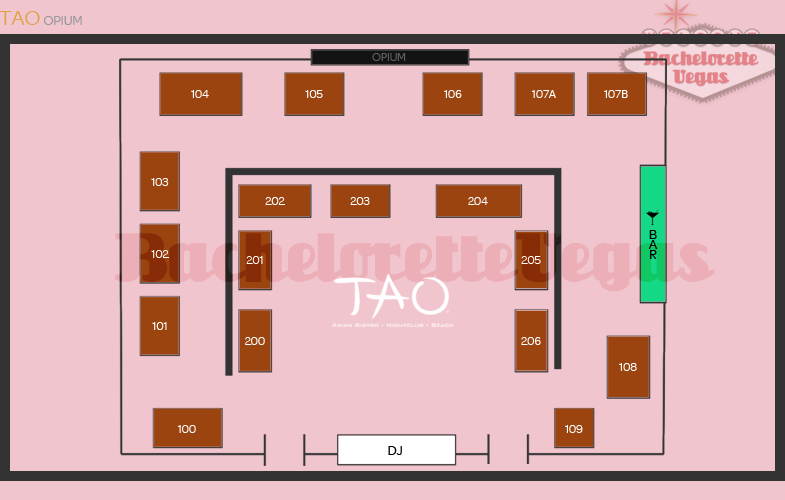 Nestled at the main entrance of the Venetian Hotel and Casino, on a nightly basis TAO is presented with a seemingly endless line of desirable patrons all vying for a coveted spot within the nightclub. The best way to by-pass the snaking line that wraps around the Venetian's main foyer is to gather your girlfriends and doll yourselves up in eye catching make-up and your most striking of clubbing outfits. It is a well-known fact that nightclub bouncers are more inclined to let in a group of gorgeous bachelorettes to ensure the inside of the club looks inviting men that are unlucky-in-love, but very lucky-in-money. 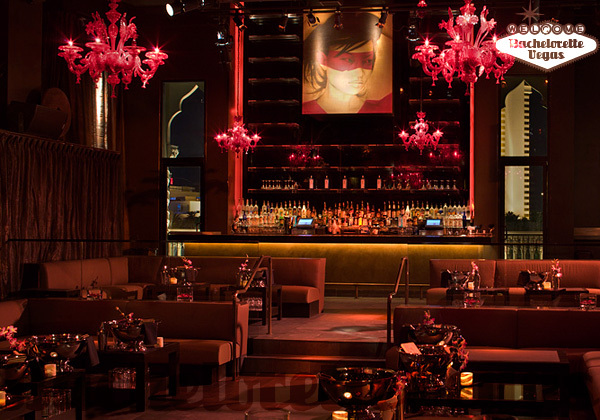 Whether it's a bachelorette party that brings you to TAO's main entrance or just a simple girls night out, if you play your cards right, you'll easily have the night of your life. If there is any indication as to how busy the club's interior is, it's the massive line outside of the main entrance. Like any club, if you utilize your assets in the best way possible you and your group will be through the door in no time. Once inside, your senses will more-then-likely go into an overloaded state. 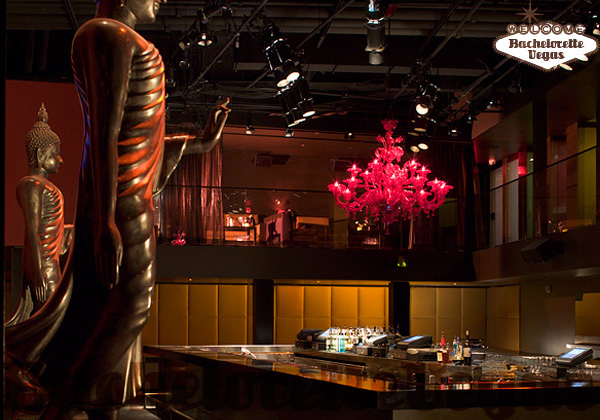 After the dizzying effect of this club's decor subsides, your eyes will be able to adjust to the welcoming sites of bathtubs filled with flower pedals and dancing vixens and a whole mess of Buddha statues. Past the flower-filled tubs, the club opens up into a vast sea of people. Though the club may be considered "old", its popularity has yet to wane. Depending on the occasion, your party will have a choice of two separate rooms. If you aren't concerned with your group getting split up, then you may find the best party to be within the venue's main room. In the main room, people tend to blur into one another as the dance floor is typically at its max capacity. You may end up loosing direction, but not matter which way you turn you'll undoubtedly be faced with a dance with any of the clubs other gorgeous patrons. 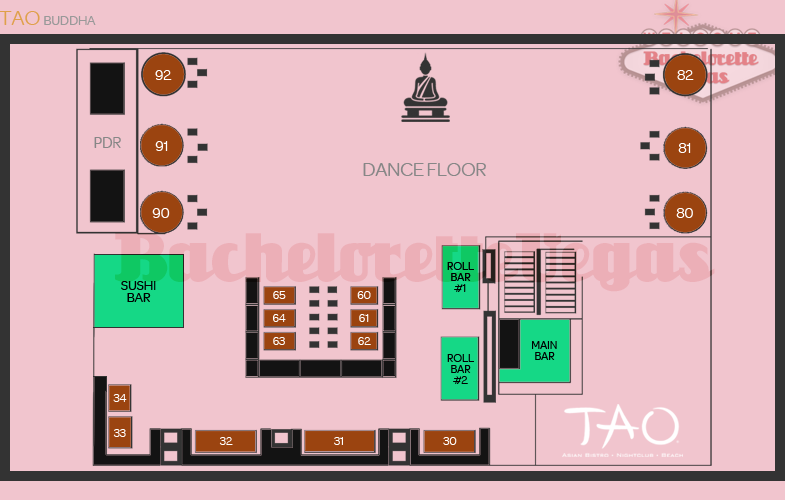 Since the main room can get pretty hectic, be sure to have a meeting point picked out for your party if you're planning on meeting back up later on in the night. You'll also want to plan your route to the bar ahead of time as the mix of little-to-no breathing room and the heavy partying could dehydrate you pretty quickly. If you and your girls aren't much into getting lost in a sea of bodies or you planned on spending the night mingling with one another and ragging on the bride-to-be, than you'll want to make sure your party spends its time at the clubs smaller room. In this room, which rests directly left of the main entrance, you'll still be treated to the heavy party-centric atmosphere, just with a lot more leg room to move around. 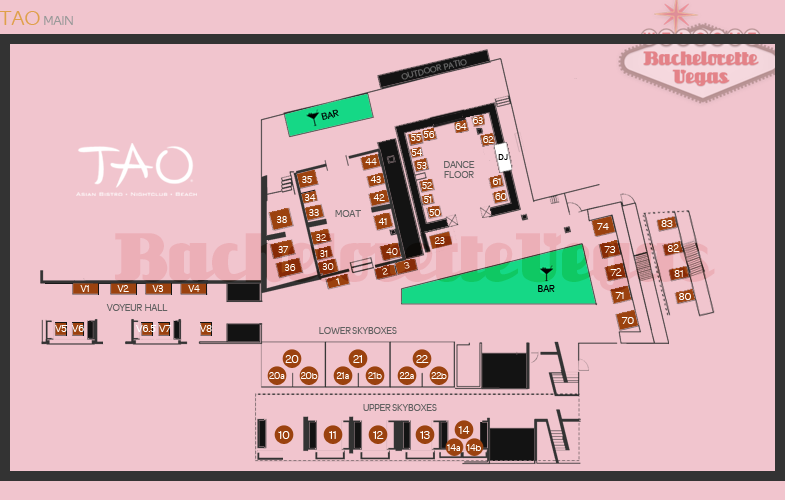 Once you get used to the smaller area, you'll completely forget about the larger and much more crowded space in TAO. 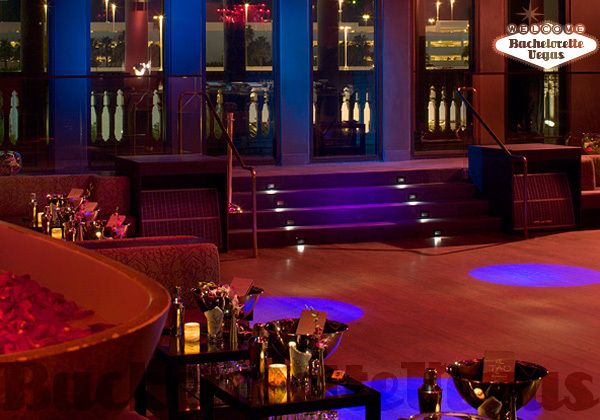 Like any other nightclub in Vegas, the best way to experience TAO Nightclub is in the comfort of a VIP booth. Seeing as how it's a girl's night out, there are two ways to accomplish this. The first and less cost-efficient way to accomplish this is to spring for the VIP table and bottle service yourselves. You can get in touch with Bachelorette Vegas and pre-arrange for the bottle service, which will also grant you a personal VIP host and VIP entry into the club. The second method, which may take a little finesse and smooth talking, would be to find some poor guy to pay for it for you. Being one of Sin City 's hottest clubs, TAO houses an array of wealthy men looking to throw their money at the first girl that talks to them. If you've got a crew of gorgeous friends with you, it just makes it all the sweeter. You could just skimp on your next girls' night out and watch teary-eyed love stories, or you and your friends can experience the top of Las Vegas nightlife entertainment at the hottest club on the Strip. 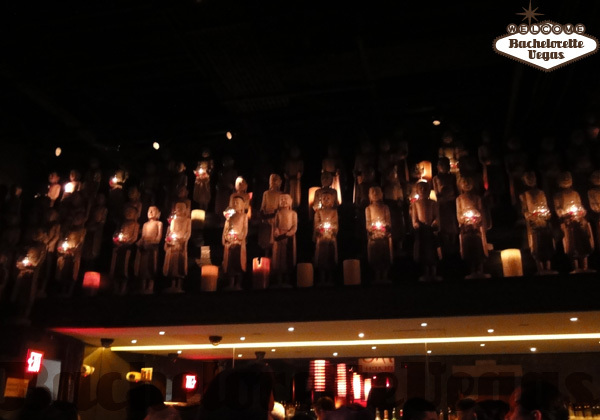 TAO may get crowded, but the crowd is enthusiastic and knows only how to have a good time. 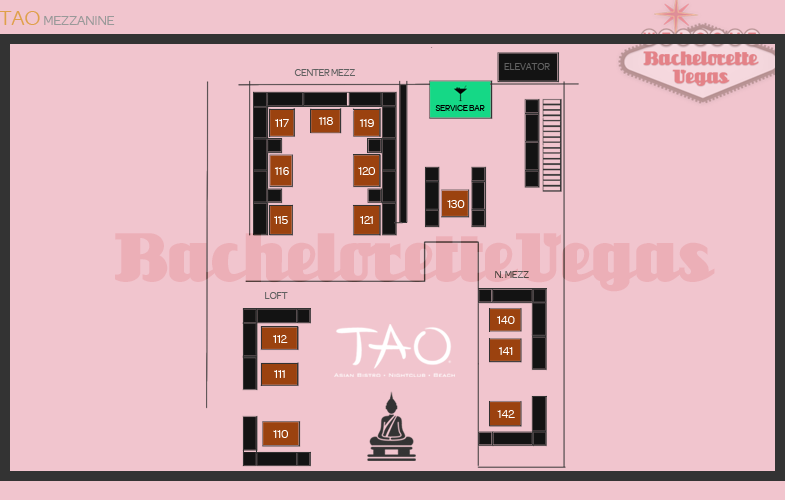 For reservation or VIP linepass to TAO Las Vegas, please contact us..